For over 25 years our company has been engaged in bus transportation of passengers. In addition to our day-to-day transport of school children, we are carrying out a regular public transport as a selected concessionaire in the regions of Bela Krajina and Dolenjska. The fast-growing domestic and international tourist transfers, made upon customer orders, play a big role in our business. In addition to the extremely professional drivers, our biggest advantage are modern vehicles with a different number of passenger seats, depending on the needs of our client. 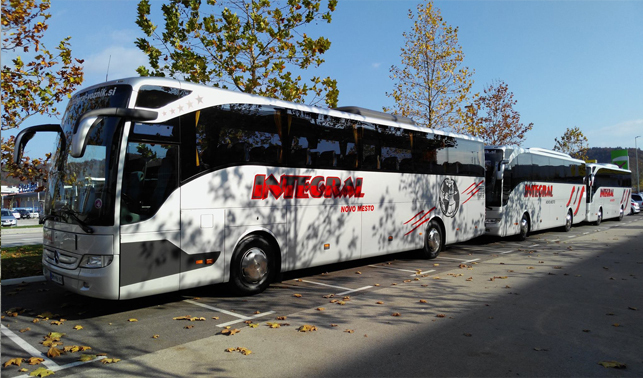 We can offer a variety of comfortable, superbly equipped vehicles; for larger groups we can provide buses with 64, 58 and 50 seats. Smaller groups can choose between buses with 40, 30, 20 and 16 seats. The smallest groups of up to 8 passengers, can rent a van. Every year the fleet is renovated with new vehicles exclusively. When we are buying vehicles, we follow current trends. This way we can highlight a new, extremely luxurious bus, designed for longer trips with 47 seats and increased legroom. The bus is equipped with modern accessories – including USB sockets. On some buses we also provide wireless internet connection (Wi-Fi). We guarantee insurance for all the passengers at the time of driving. You can place your order through our website or you can give us a call. Ensuring the efficient, safe and comfortable transportation of passengers in road passenger transport. To become the leading provider of bus services in the field of the South-East of Slovenia.